Germany’s Frank-Walter Steinmeier and France’s Jean Marc Ayrault visited eastern Ukraine on Thursday, hours after Russian-backed separatists and Kiev agreed to a new unilateral ceasefire. 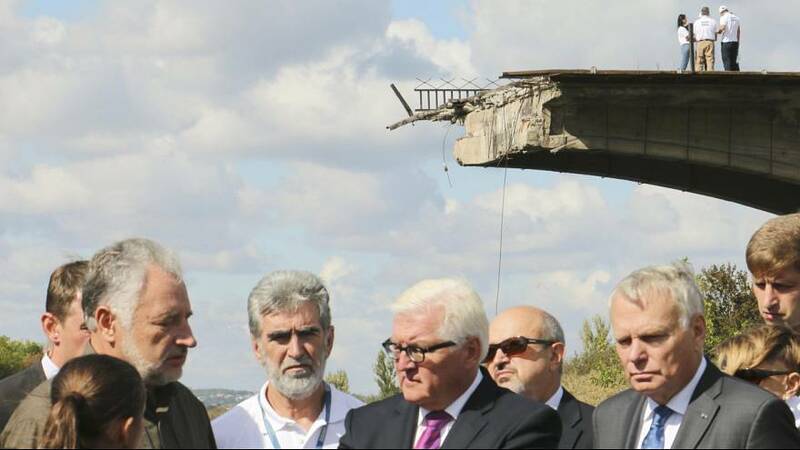 But as the two foreign ministers went to see a bombed bridge in the town of Sloviansk, there were reports of violations by both separatist rebels and Ukranian forces. The new seven-day truce aims to provide new momentum to the Minsk peace agreement signed 18 months ago. But in the eastern city of Donetsk, residents reported fresh fighting. “At 6 a.m. I was walking my dog and at about ten to seven, or soon after seven I heard powerful distant sounds (of shelling)… Of course I cannot say exactly (what it was), I am not an expert. But they were powerful, I am sure they were larger than 100 mm guns,” one man said. “On the first of September they also said there was a ceasefire. But they (Ukrainian forces) kept on shelling,’‘ said another woman. Despite those accounts both international monitors and Ukraine’s military reported a significant decrease in fighting since the ceasefire came into force at midnight on Wednesday.